It was a rainy day in the Pridelands, and the royal family decided to invite Tiifu, Zuri and the Lion Guard in to the Royal Den to shelter from the rain. Timon and Pumbaa decided to also come along, and things got crowded in there. "it is boring if we cannot play outside" Tiifu yelled. "my fur gets ruminated into the rain, I prefer to stay indoors" Zuri anwered. Kion ends the conversation with a loud roar. "Let's do a game.. like a contest!" he screams. "please don't" Simba sighs. Nala shrugs and runs off. " nobody is hungry and hunting time is over, naptime for me." Nala curles up and falls asleep. Bunga, Ono and Beshte conjoin into the idea of Kion.
" a quizz! I ask and you answer!" Kion screeches. 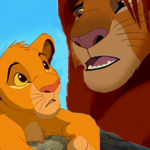 Kion starts with a simple question.
" When is somebody an animal with white fur and red eyes?" "albining!" Besthe remembers. I had an uncle who went pink and died!" They burst into laughter. "One point for Beshte!" Kion comes up with a new quiz question. "What is rain season like?" Bunga starts screaming. " I know! Mongoose!" "No humblebee it is Monsoon" Beshte corrects into Bunga. "Whatever, Zookah Zahma!" Bunga yells and runs outside the den for a rain dance. All the others follow him and have fun in the rain. It was a fun day.